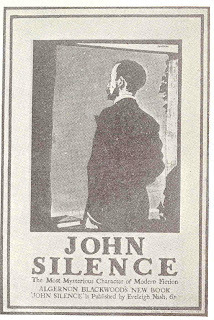 His John Silence, published some months ago in England, was described as having for the hero the most mysterious character in fiction, and the poster which we reproduce herewith caused considerable talk as a successful rendering of this motif. The picture is fairly small, and the scan is the best I can do. But I wish I could find an original poster, though I doubt many have survived the century since it was issued.